An incredible 45 Spartans were in Scotland to run in the Edinburgh Marathon Festival. Much kinder conditions than the recent London and Milton Keynes Marathons, a great course and effective preparation with the Spartans coaching team and training groups helped many to achieve fantastic new personal bests. Three Spartans beat three hours in the full marathon. 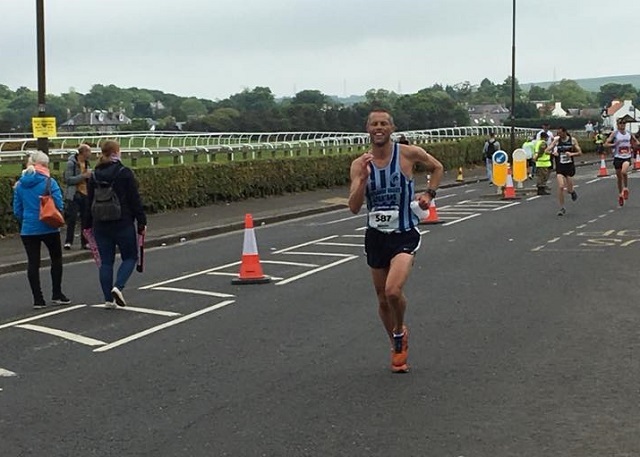 SIMON JACKSON took 52 seconds off his personal best to come 65th out of the 7,664 finishers (top 1%) in 2 hours 50 minutes 49 seconds; less than two minutes later in came STEFFAN FORD, also top 1%, in 75th place with a new PB of 2 hours 52 minutes 35 seconds – a whopping 6 minutes 9 seconds improvement for a runner who was already sub 3. DAVID RIDDELL completed the sub three trip with 2 hours 57 minutes 44 seconds. 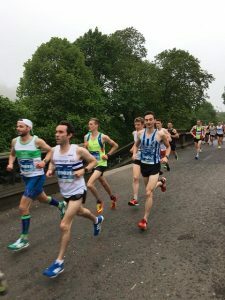 STUART ARCHER chalked up the biggest marathon PB with 12 minutes 14 seconds, for 3:18:20 with VICTORIA BRETT not far behind with an 11:33 PB for 4:43:18. KAREN PALMER 4:23:33 (9:51 improvement) and JAN FRY 5:02:19 (6:12 improvement) also ran new PBs. 18 of the 7,664 finishers were Spartans. CALLUM STEWART was top ten out of more than 10,000 finishers in the Edinburgh Half Marathon. He was eighth in an impressive new half marathon time of 1 hour 13 minutes 15 seconds. CLAIRE EMMERSON first female from Fairlands in the half set a new PB of 1:41:05, and improvement of 4:57; RUTH REILLY was less than a minute behind with 1:42:01. Despite recovering from injury HAZEL SMITH ran a new PB of 1:47:35. Other new personal bests came from JENNY GARRETT 1:51:50 and TRUDIE MOLLOY 1:56:51. 27 of the 10,531 finishers were Spartans. Wow. 63 Spartans at the second Mid Week Road Race League fixture, that’s seven more than race one. The Fairlands Valley men finished three complete teams and still had some to spare. ASHLEY SCHOENWETTER was fastest woman from the club with a new personal best (PB) of 42 minutes 21 seconds – a 57 second improvement. YUKO GORDON won the women over 65 contest with an incredible 45 minutes 20 seconds while MARIE COLUCCI is back, third Fairlands female in 48:23. DAN McALPINE headed up the men’s “A” team with 34 minutes 17 seconds and fourth out of the 436 finishers, that was up 42 on the first fixture in Epping Forest. Opportunities to run the classic middle distance race, the mile, are rare these days. Spartan YUKO GORDON grabbed the chance and WON the British Masters Mile Championship for women 65 plus in 6 minutes 38 seconds. ANDREA WESTCOTT was seventh in the 45 plus category with 7 minutes 58 seconds. ALISON SHELLEY is new to the Spartans having joined just a few weeks ago. She took part in her first ever 10K run on Sunday 20th May at Wimpole Estate and finished in one hour and 54 seconds net. She was 322 out of 534, more than 200 behind her in her first race in the Hoohaah 10K. Starting slowly following his 10K effort the night before JIM BROWN completed the Serpentine Last Friday of the Month 5K in 25 minutes 28 seconds. He was third in his age category. Tired for his third race in four days JIM BROWN still managed to take 28 seconds of his year’s best time at the Hatfield Broad Oak 10K on the Bank Holiday Monday morning. He said, “I was hurting at 2K and thought it was all going to end in tears but helped by a fantastic flying final 1.5K all ended well and I was pleased with 49:22. Finishing at a village flower festival meant I was straight in the tea tent.” PAUL HOLGATE finished in 56:02. There were 1,115 finishers. New member ALISON SHELLEY ran a new personal best of 57 minutes 53 seconds, improving by 3 minutes 1 second. TIM SABAN was the fastest Spartan with 42 minutes 40 seconds while SARAH SAPSTEAD ran a new season’s best (SB) of 1:07:46 and JONATHAN JONES finished in 53:56. As Stevenage’s weekly Parkrun reached its milestone Second Birthday fifteen Spartans came out to celebrate. DAN MCALPINE led the 338 strong field home in a time of 16 mins and 44 secs, and LYNSEY CHALKLEY a new PB of 32 mins and 39 secs. DANNY SCANLON was the tenth man to finish in a time of 19 mins and 45 secs and KERSTEIN WEINER the fortieth woman in a time of 30 mins and 12 secs. CHRIS HOLLAND, MARK BEASLEY, LEE PICKERSGILL, SAM SIMONS and DAVID SCOTT all finished in under 30 minutes with times of 22 mins 30 secs, 25 mins and 20 secs, 26 mins and 9 secs, 29 mins and 13 secs, 29 mins and 14 secs respectively. Across the rest of the event, SALLY PHILLIPS ran a time of 31 mins and 16 sec, STEPHEN SMITHSON at time of 34 mins and 47 secs, and NIKI PLUMB a time of 35 mins and 15 secs. Further afield, first time attendance was recorded for JOHN ROXBOROUGH at the Heartwood Forest event in 22 mins and 4 secs, and MICHAEL O’KEEFE at Cassiobury in 26 mins and 53 secs. NATALIE LAWRENCE was the fourth woman to finish at Houghton Hall in 18 mins and 56 secs. DANIEL SUTTON and VERITY FISHER attended Moor Valley and ran 38 mins and 36 secs and 48 mins and 6 secs in turn, while at Panshanger THOMAS SAUKA finished in a time of 21 mins and 5 secs. 182 147 Paul JENNINGS 00:29:28 new PB! 237 62 Lynsey CHALKLEY 00:32:39 new PB!